First Line: "Gonzo's not going to make it." Salida, Colorado's economy is driven by tourism and the white water rafters who flock there to try the Arkansas River. 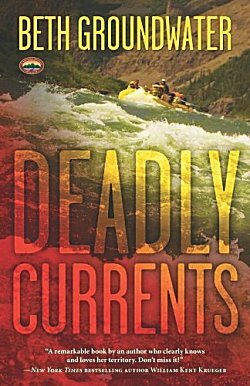 River ranger Mandy Tanner risks her own life to save a man after a rafting accident, but the man dies anyway. As it happens, nothing Mandy could do would have made any difference. Tom King was murdered, and there was a long line of people who don't mind seeing him dead. When another death hits much closer to home, Mandy begins to think that the two deaths are connected... and she won't rest until she finds the truth. Beth Groundwater has written one strong mystery and her knowledge of whitewater rafting and river lore brings her Colorado setting to life. No matter how strong the mystery or how vivid the setting, I am a character-driven reader, and I have to admit that I had a couple of problems with Mandy Tanner. For one thing, she's too emotionally immature for me. She blew up at the slightest provocation even before the second death in the book. She's also one of the clumsiest investigators I've ever seen. Out of that long suspect list, I don't think there's a one of 'em that she didn't antagonize. Last but not least, there's a killer on the loose and she's going around town making everyone furious, but Mandy is very lackadaisical about getting that large broken window fixed in her house. As good as the mystery and setting are, it will probably be a while before I read further into this series. Mandy simply didn't make a good first impression. I like the location, but probably won't rush to read this one. I want to say that I might have a copy, but can't remember right now. I've not ever been whitewater rafting - too scary for me. Actually, I'm listening to a book right now that is set in Maine and has rafting and some women on a vacation. So far, so good, but I know things are about to get dicey. That's the thing, I think, Cathy. If you don't warm to the main character, it's hard to really get drawn into a series. Still, I'm glad you found some things to like.